This news item was posted in Pakistani News category and has 1 Comment so far . PESHAWAR: As raging floods wreaked havoc across Khyber Pakhtunkhwa and some Fata regions, inundating large parts of Nowshera, Charsadda and Swat, the people of Dera Ismail Khan were warned on Friday of a similar disaster after 400,000 to 500,000 cusecs of water discharged from the overflowing Tarbela reservoir threatened all natural and man-made protective barriers in the district. The calamity which a minister described here on Friday as the worst in the history of the province has claimed at least 500 lives. Thousands of villages have been submerged by rivers bloated by torrential rains; roads have been blocked by landslides and about 400,000 people have been forced to leave their homes. Provincial Information Minister Mian Iftikhar Hussain said at a press conference that the death toll could rise. He said Charsadda, Nowshera and Swat were the worst affected areas where thousands of people were marooned in flooded villages and needed immediate evacuation and food supply. “The province is facing the worst natural calamity of its history,” he said, adding that the situation would turn into a humanitarian disaster if the international community did not extend immediate help. Thousands of people, including women and children, have taken shelter on rooftops in Nowshera and suburbs of Peshawar and are waiting for evacuation, food and water. Most parts of Nowshera district have been inundated and over 200,000 people are marooned. Anger is growing among the affected people because of slow pace of relief work and delay in evacuation. Demonstrations were held in Pabbi and Taro Jabba with protesters demanding evacuation of stranded people. “Our women and children have been swept away and people are dying of hunger and thirst, while ministers are flying in helicopters just as eyewash,” Arbab Ali Akbar of Taro Jabba, who was leading the protesters, said. 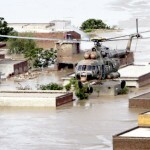 Mian Iftikhar said floodwater was affecting rescue work because helicopters could not airlift stranded people. Flash floods and heavy rain have caused widespread devastation in Peshawar, Charsadda, Nowshera and Swat, while landslides and lightning have killed about 100 people in Kohistan, Upper Dir and Shangla districts. Surges in the Kabul and Swat rivers have swept away houses, bridges and communications system and inundated agricultural land. Dera Ismail Khan is facing a severe threat because of a heavy discharge of water from the Tarbela reservoir and authorities have warned local people to move to safe areas. The release of water from Tarbela, according to the officials, could cause backflow in the river Kabul, causing further threat to Nowshera. Parts of the Islamabad-Peshawar motorway, Grand Trunk Road and the railway line between Peshawar and Rawalpindi have been submerged. Long queues of loaded trucks were seen on both sides of the GT Road between Peshawar and Nowshera. The ISPR said 14,250 stranded people had been evacuated in Swat, Peshawar, Risalpur, Nowshera, Swat and Tank by helicopters and boats. The army has deployed 17 helicopters and seven more will be added to the fleet on Saturday. The flood warning centre in Peshawar said that the water level in all rivers, including Swat and Kabul, was receding and the situation was likely to improve if upper parts of the region did not receive more rains. Prime Minister Syed Yousuf Raza Gilani, ANP chief Asfandyar Wali Khan, Chief Minister Amir Haider Hoti and Governor Owais Ahmad Ghani had an aerial view of the affected areas of Peshawar valley. Peshawar Corps Commander Asif Yasin Malik also visited affected areas. Landslides triggered by torrential rains and lightning caused a large number of casualties in Kohistan, Upper Dir and Battagram. Police said 55 people had gone missing in Pattan area of Kohistan district over the past three days. “Only one body has been found,” an official said by phone, adding that the administration was yet to receive reports from remote areas. He said that the number of casualties might increase because landslides had hit houses in narrow valleys. According to official reports, 29 people were killed and eight others injured in Battagram. Officials said that 26 people, 11 of the same family, were killed in Ashari Darra area of Upper Dir when lightning struck several houses on Thursday night. Nine bodies were still to be found, local resident Iftikhar said. In Kohat division, 39 people have died and 25 others injured. Two bridges have been washed away. Four people died when a house collapsed in Malakand district on Thursday night. Parts of Swat valley were cut off from other areas after the Jalawana bridge linking Mingora with Malakand collapsed. About 7,000 acres of farmland has been submerged in Swat. Witnesses said that hundreds of people of Swat, Upper Dir and Lower Dir were stranded in Batkhela. A bridge linking Lower Dir with Malakand was damaged. The information minister said at least 60 bridges had been destroyed. A newly constructed part of a dam in the Charsadda district collapsed, while the UN said it had reports 5,000 homes were under water in the area. Mian Iftikhar said it was estimated that about 400,000 people were stranded in various villages. “A rescue operation using helicopters cannot be conducted because of the bad weather, while there are only 48 rescue boats available,” he said. The meteorological department said an “unprecedented” 312 millimetres of rain had fallen in the region in 36 hours, but predicted only scattered showers during coming days. Provincial Relief Commissioner Shakil Qadir said that around 2,800 holidaymakers were stranded in Swat and efforts were being made to airlift them to safety. Provincial Senior Minister Bashir Ahmad Bilour said that about 80,000 people had been affected in Peshawar alone. Correspondents Abdul Sami Paracha from Kohat, Gohar Ali Gohar from Malakand and Zahid Jan from Upper Dir contributed to this report. 😥 we must help those people who are affected by flood.